Catalan National Day celebrations, September 11, 2018.Nr Photo?prss Association. All rights reserved. In the United States, the protection of speech can be traced back to the foundation of the country, hence its prominent and purposeful inclusion as part of the first amendment to the Constitution. Over the course of two hundred plus years that freedom has been tested, and political and civil society leaders from different generations – from George Washington to Frederick Douglass to Cesar Chavez – worked to ensure the tradition of speaking truth to power remains a pillar of the American Republic. An opposite approach has been taken in Spain, where current law treats peaceful protest as a public security concern, assigns heavy fines for acts of civil disobedience and criminalizes speech online, giving security services extraordinary powers, while limiting citizen protections. As political tensions have risen between Madrid and Barcelona over last year’s independence referendum, the restrictions on free speech and assembly have gone into overdrive. Leaders of two of Catalonia’s largest civil society organizations have languished in preventative custody since October 2017 on charges of sedition, even though video evidence disproves the charges, which have been condemned internationally. And nine former members of Catalonia’s government and parliament are also jailed, even while their colleagues who chose exile rather than arrest – including Catalonia’s former president Carles Puigdemont – live freely across Europe. But measures to quash basic freedoms in Catalonia have not been aimed solely at political and civil society leadership, rather they have targeted dissent more broadly. But measures to quash basic freedoms in Catalonia have not been aimed solely at political and civil society leadership, rather they have targeted dissent more broadly, including the right to protest, debate, and even artistic expression, with Spain recently assuming the dubious distinction of incarcerating more artists than any country in the world. In the same vein, Amnesty International released a report this year which details the abuse of counter-terrorism laws to restrict expression online, most graphically symbolized by the unprecedented step of shutting down websites and apps by authorities, violating both the Universal Declaration of Human Rights and the European Convention on Human Rights in the process. Much of the justification of repression by Spanish authorities comes in the form of comparing pro-independence leaders and organizations to the Nazis, a spurious accusation which sadly serves as a familiar bogeyman for prominent former and current officials of both the left and the right in Spain. Astonishingly, the consensus extends to the far-right, where in a recent act of extraordinary irony, the far-right Spanish party Vox, writing to a German court, compared the Catalan president in exile to Hitler. By linking those who speak out or question the political status quo to Nazis and extremists, these otherwise mainstream politicians have stacked the deck against any possibility of negotiating over legitimate political demands. The Spanish judiciary meanwhile turns the law on its head to quench dissent, in a perverse and systematic abuse of legislative intent meant to protect speech, assembly, minorities and the vulnerable. By weaponizing hate speech legislation, a national minority is now cast as the extremist oppressor, and anything goes to silence and jail its political and civil leadership. By weaponizing hate speech legislation, a national minority is now cast as the extremist oppressor, and anything goes to silence and jail its political and civil leadership. In Spain, current legislation allows for the proscription and prosecution of dissent, which Spanish institutions have used to criminalize what is inherently a political question. Here in the United States, the first amendment protects speech, even speech we don’t like, precisely because it takes interpretation out of the hands of the state and forces it back into the public square. It encourages debate rather than litigating it. 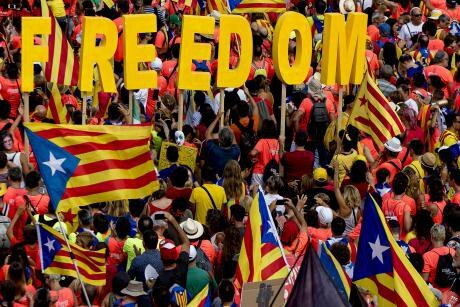 If applied in Catalonia, incarcerated and exiled political and civil society leaders would be able to participate openly and without fear of retribution in social and political life, free to seek democratic solutions to political questions. Catalonia’s national day, which falls in September, commemorates the loss of the War of Succession of 1714, after which Spain moved to quash Catalonia’s centuries-old institutions and liberties. This year, for the seventh consecutive year, a massive, peaceful march of one million Catalans commemorated that loss, conscious that the struggle to protect and defend those rights marks their present as much as their past.